Michelle Moran's Guest Post + Giveaway!! What an absolute treat- Michelle Moran author of Nefertiti (read my review here), The Heretic Queen and now: Cleopatra’s Daughter is here to grace my blog with a wonderful post! This lady is brilliant, extremely talented, beautiful and the sweetest person ever! What an author! Michelle Moran’s books can literally sweep you off your feet, and capture you into another historical dimension. It began with a dive. Not the kind of dive that people take into swimming pools, but the kind where you squeeze yourself into a wetsuit and wonder just how tasty your rump must appear to passing sharks now that it looks exactly like an elephant seal. My husband and I had taken a trip to Egypt, and at the suggestion of a friend, we decided to go to Alexandria and do a dive to see the remains of Cleopatra’s underwater city. Let it be known that I had never done an underwater dive before, so after four days with an instructor (and countless questions like, Will there be sharks? How about jellyfish? If there is an earthquake, what happens underwater?) we were ready for the real thing. We drove to the Eastern Harbor in Alexandria. Dozens of other divers were already there, waiting to see what sort of magic lay beneath the waves. I wondered if the real thing could possibly live up to all of the guides and brochures selling this underwater city, lost for thousands of years until now. Then we did the dive, and it was every bit as magical as everyone had promised. You can see the rocks which once formed Marc Antony’s summer palace, come face to face with Cleopatra’s towering sphinx, and take your time floating above ten thousand ancient artifacts, including obelisks, statues, and countless amphorae. By the time we had surfaced, I was Cleopatra-obsessed. I wanted to know what had happened to her city once she and Marc Antony had committed suicide. Where did all of its people go? Were they allowed to remain or were they killed by the Romans? What about her four children? It was this last question which surprised me the most. I had always believed that all of Cleopatra’s children had been murdered. But the Roman conqueror Octavian had actually spared the three she bore to Marc Antony: her six-year-old son, Ptolemy, and her ten-year-old twins, Alexander and Selene. As soon as I learned that Octavian had taken the three of them for his Triumph in Rome, I knew at once I had my next book. This is how all of my novels seem to begin – with a journey, then an adventure, and finally, enormous amounts of research for what I hope is an exciting story. ***Michelle is graciously offering one SIGNED copy of Cleopatra’s Daughter to the lucky winner of this giveaway! 1- Please post your comment and email address for one entry. 2- Tweet about this for an extra chance and send me the tweet! ****Please NOTE: Michelle is hosting several contests on her website. Please feel free to spread the word, or enter any of the contests. The prizes include signed copies of Cleopatra's Daughter, gold Cleopatra earrings, and Roman artefacts!!! Thank you so much Michelle Moran! Guest Post by The Raucous Royals Author!!! Today I’m honored to have Carlyn Beccia the wonderful author of The Raucous Royals as our guest here au "Salon de Josephine" at Enchanted by Josephine. Carlyn also runs The Raucous Royals Blog. If you've never visited this truly amazing site- you don't know what you're missing! The place is an historical adventure per se, filled with enchanting artwork, a witty sense of humour, and the most interesting and unbelievable historical information ever. Today, enticingly to our taste, Carlyn has written an exquisite piece that I know you’ll find most interesting. This lady just has a knack for blending history, notable characters of the past, prose, language and spark, into a literary creation that transports you right into the moment. 13-year old Lucia Elizabeth Balcombe Abell or Betsy never expected much excitement on the sleepy island of St Helena. Like a real life Gilligan’s Island, she appropriately described her home as “an Eden blooming in the midst of desolation.” (1) But her peaceful world was about to be turned upside down with the arrival of the infamous ‘Little Boney’. On October 17th 1815, General Napoleon Bonaparte pushed his way through a sea of gawking onlookers on his way to the Briars residence that would become his island prison for the next two months. Before Betsy had even laid eyes on Napoleon she confessed her terror of such a frightening ogre, “with one flaming red eye in the middle of his forehead, and long teeth protruding from his mouth.”(1). Most of the British papers had demonized Napoleon as a warmonger willing to crush his closest friends in the pursuit of power. Naturally, Betsy was expecting a dark, child-eating monster to appear before her. Her impression changed suddenly when she realized her dark monster was actually morosely pale with beautifully sculpted features, childlike hands, and quite an infectious smile. Thereafter, something extraordinary happened in the secluded glen of St Helena. The little Corporeal and this imaginative young girl became the strangest of friends. After Napoleon’s death, Betsy wrote about their enduring friendship in her memoirs titled Recollections of the Emperor Napoleon. In these memoirs, we see a very different side to Napoleon as Betsy recounts tales of a mischievous jokester who kept liquorices in his waistcoat pocket and was always quick with a prank and a pinch of “Mademoiselle Betsee’s” ear. On one occasion, she recollects how Napoleon dressed a servant in a sheet to scare the kids into thinking he was a ghost. In turn, Betsy did her share of teasing back. Once, she stole Napoleon’s sword and pretended she would run him through with it. It’s hard to imagine the majestic Napoleon trapped in a corner by a mere wisp of a girl. But although Napoleon and Betsy had their share of horseplay, Napoleon would also admonish Betsy like a stern father. He often quizzed her about history and told her stories of Cardinal Richelieu. Like a relentless schoolmaster, he would drill Betsy in her French translations until she had mastered her lessons according to Napoleon’s standards of perfection. We can imagine that having Napoleon as a tutor could not have been easy. Betsy also did not refrain from prying into Napoleon’s love life. 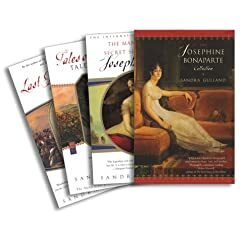 One of the most fascinating parts of her memoirs is when Napoleon confessed his enduring love for Josephine. He tells Betsy that she was, ‘grace personified’ and the ‘goddess of the toilet – all fashions originated with her.’ (2) He idealistically recalled how passionate she was about the arts and how she would have little disputes with him if she was not allowed to purchase art for her galleries. He even spoke of his divorce explaining that the dissolution of his marriage was based solely on politics and never a lack of love. According to Betsy, Napoleon always got mournful after speaking of Josephine and he was happy that she had not lived to witness his final fall from power. We will never know for certain how intimate Napoleon became with his young prot?g?. Supposedly, there were rumors that Betsy and Napoleon’s relationship went beyond innocent teasing, but these rumors seem unfounded. If we are to believe Betsy’s memoirs, Napoleon acted more like the big brother that relished in taunting his sister than the steamy paramour. There is a movie being made about their relationship scheduled to be release in 2010. We can guess Hollywood’s version of events will probably include some sexual tension with the swords play. 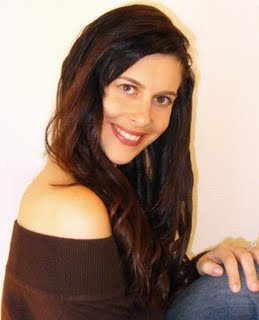 Carlyn Beccia is an author and illustrator of books for young adults including the recently released, The Raucous Royals. Get your weekly fixed of royal scandals and rumors at The Raucous Royals blog. Balcombe Abell, Lucia Elizabeth, Recollections of the Emperor Napoleon, Plover, WI: J. Murray, 1845. Markham, J. David. To Befriend an Emperor: Betsy Balcombe's Memoirs of Napoleon on St Helena, UK: Ravenhall Books, 2005. Thank you so much Carlyn for this fantastic guest post! This fantabulous classic was part of my read for the Everything Austen Challenge. My love for anything and everything Victorian has helped me embrace this novel set in the Regency Period, and so, naturally I fell in love with this timeless piece. This story of the very different Dashwood sisters and their clashing tastes in their choices of men to love, was endearing as well as very frustrating at times. Just when I thought the obvious about Colonel Brandon, Edward or Willoughby- the story took a different turn just to add to the intrigue of it all; classic Austen at its best. The story revolves around love-sickness, love-triangles, a marriage of convenience, age and love, differences of choices and opinions, wealth and social status, influence, family conflict, secret-filled pasts and ultimately…and appropriately so: sense and sensibility. I’m still not sure which of the sisters I concurred with the most; Elinor or Marianne... Austen brilliantly shifts us from one perception to the other while embracing both depending on the situation. Ultimately the girls’ reconciliation and love for eachother blends the disparities of state helping them come to terms with their own serenity. Love can then be found and accepted under a new light. One can never get enough of elegantly written suspense-filled love twists and pangs. At least I can't- Loved it! The story is divided in 10 chapters of approx 3-8 pages; easy English for readers ages 7-9; beautiful illustrations in every chapter. Perfect for read-along- or for parent to child reading. The story of Alice in Wonderland begins with Alice sitting on the grass with her sister who is reading a book. Having herself nothing to read and being completely bored, Alice curiously follows a rabbit down a rabbit hole. Through this deep hole, Alice is led into a world filled with strange creatures and their unusual habits. Alice is amazed to discover that she can transform her size in order to fit in every strange situation to avoid danger or simply to go from place to place. My favourite part of the book is when Alice talks about how her cat Dinah loves eating mice and birdies in front of the mouse and the birds. That was funny. I also liked the queen because she kept on repeating the same thing over and over. She was also funny and strange, just like the disappearing cat. What I think: It was a really, really good book, and you should buy it. The Book Chook is also promoting the second free edition of Literacy Lava 2 Go check it out! What could be better than reading about the sumptuous life of a favourite love in Charles II’s life? Compound this with an in-depth look at the life of his beloved sister Henriette (whom I simply adore); seen through the eyes of our heroine, Louise de Keroualle, her principle maid-in-waiting- and you have a book that I just devoured. Although Louise came from an average background, her honourable and loyal family, through merit, was granted the privilege of sending her to the French Court at the service of Madame Henriette. Due to Louise’s genuine kindness and honesty, absolute loyalty, prim demeanor, chaste morals and devoutness to her Catholic faith, this lady-in-waiting raised the bar for herself and soon became Madame’s closest, most trusted and devoted companion. Poor Henriette (also called Minette), led a tragic life at the hands of her husband, le Duc D’Orleans (her first cousin as well as Louis XIV’s brother). Finding no love in this demeaning relationship, she gave herself completely to the cause of re-kindling ties between France and England through her brother Charles II and her cousin, Louis XIV. This project consumed her completely; bringing her much of the sanity needed to survive (although briefly) through it all. Henriette dedicated her time in planning her most-awaited reunion with her brother, whom she adored to no end. She would spend endless hours talking to Louise about her brother’s exceptional qualities, along with his charms and loving manners towards the ladies. Henriette thought the world of her brother and this image she portrayed of Charles as being the most perfect, kindest, gentlest and most handsome man ever, helped propel him into the role of hero of Louise’s love fantasies. Young and very impressionable, she became enamoured of King Charles II. Before even meeting him, Charles became Louise’s secret Love of her life. These plans finally unravel when Louis allows Henriette to visit Charles in England. Madame is then reunited with her loving brother where she manages to strengthen the ties between the two countries while convincing Charles to convert to Catholicism- Madame’s most important objective. This is not all that Charles is ventured into. Once he lays eyes on Louise de Keroualle, the King becomes floored by her beauty (English tastes differing from the French…). Louise de Keroualle, a real lady in every sense, captures the heart and soul of this magnificent King. From then on, Louise’s life would take a sharp turn away from the high aspirations of marrying respectably. Although she would keep a strong hold on her virtues until a solid commitment was reached, inevitably she would forego all to become the King’s favourite. Different from most mistresses of the time, Louise would only know Charles, and be loyal to him for life. Because of her strong devotion to Charles and her selfless dedication to Henriette, Louise comes across as an incredibly warm, loving and caring person; it’s no wonder she was adored and held in the highest esteem by both these royal siblings. The French Mistress is a definite page turner. The story, written in the first person, gives a brilliant account of the life in the times of both the French and English Courts. The story completely drew me in. I loved reading about the particularities in the lives of two of my very favourite royals. Susan Holloway Scott details the scenes, filling them with emotional dialog and in-depth character perceptions that clearly bring the period to life. I couldn’t help feeling a kinship with Louise and concurring with all her thoughts and emotions- almost like reading the memoirs of a close friend. The book is beautifully written to vividly depict this most grandiose time in all of its spendour, without being devoid of its tragically sad and scheming deceptions. If like me, you love the extravagance of the French courts of the 17th century; the magnetic and totally charming Charles II spins your fantasies; the superb Louis XIV completely fascinates you; the most graceful and loving Henriette endears you…then, you have got to read about this exquisite French mistress’ take on all of it. I guarantee you’ll love this book. Just recently, one of my good friends said she might like to start reading some HF..Yippee! I thought- finally someone in the real world who can share my passion face to face! OK, well I’m not getting overly excited cause I realize this genre is not for everyone...but I’m hopeful. She’s the type of gal that usually loves biographies, political stuff, and books on sprituality. But now, she says she’s ready to get into the history of royals and is very curious. But then, as Arleigh pointed out, I should be careful not to scare her off with stuff that’s too heavy for a beginner..so her suggestion was a Philippa Gregory- since she’s usually a good one to hook people into the genre. With all this talk about courtesans, book reviews and all- I thought it would be interesting to post about a very famous Venetian one named Veronica Franco. Born in 1546, this famous Venetian courtesan and poet, learned the trade from her mother Paola Fracassa, once a courtesan herself. Veronica had three brothers and it is from their tutoring that she too was inspired to become an intellectual, well versed in poetry, music, Greek and Roman literature. 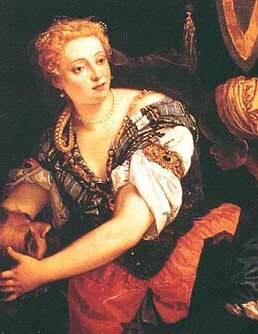 Veronica Franco was part of the higher nobility of Venice. She frequented people of influential status and was always part of the very literary world. She was a regular at Venier’s literary salon and often was a guest of his palace as well, where she routinely participated in discussions actively contributing to the editing of major poetry anthologies. Veronica published a volume of ‘letters of her youth’ as well as a volume on poetry: Le Terze Rime. In her letters, she also addresses Henri III of France, who apparently visited her regularly…She also gives homage to Tintoretto for having painted her portrait. Before starting her career as a courtesan, Veronica was married for a brief time to a notable doctor, Paolo Panizza. The marriage ended on a sour note. Believing in human equality, Veronica could never be tamed into pressured submissiveness- she was merely 18 years-old. After the split, Veronica felt compelled to complement her artistic work in order to support herself financially. Being a courtesan helped her make the right connections; meanwhile her poetry and rhetoric became the voice for underprivileged, battered an abused women who had none. Both lines of work helped fulfill her profession and propel her into great wealth. Consequently, Veronica created an organization that helped courtesans and their children. Throughout her endeavors, Veronica always had a full house of mouths to feed. Besides her own three living children (of six), Veronica also provided food, shelter, and in some cases, education, to nieces, nephews, orphaned children, servants and tutors. Her home was the place for musical concerts (she played the lute), banquets and feasts; where great artists, musicians and noblemen were regular guests. However, all splendor of a lavish life was brutally put to an end in 1575 by the plague of Venice- Veronica had to flee the country. When she finally returned, she was devastated to find that not only all of her great wealth was gone- she was also being falsely accused by the Inquisition, for sorcery in attracting and luring men through magical spells. It was documented that Veronica, with much dignity, brilliantly defended herself against all accusations in her vibrant Venetian dialect filled with rhetoric and ingenious responses. She was acquitted of all charges. Little is known of how she lived the rest of her life, but many accounts suggest that she never regained her wealth and was believed to have died in meager surroundings- with not much to account for. She died in 1591 at the age of forty-five. I would definitely consider Veronica Franco for the Woman Unbound Challenge series because of the choices that she made for herself-notwithstanding the consequences of these. Veronica Franco accepted to live her own life according to her own rules while using her strenths to achieve success. Her true passion was in her writing- something that was denied to women of her times. Her voice needed to be heard and her only vehicle of transmitting her message was by achieving some sort of popularity and recognition. Although she used her intellingence, beauty, charms, and a very controversial form of networking, to get her work published and her career settled- she was often scorned and rebuked for this. Yet, she never gave up and turned what could have been a degrading fate for her, into a lucrative business, helping her not only put food on the table for herself, but her whole family as well. She helped other women survive and also helped create shelters and aid for women who would have othersise been left to their own sad and poor demise. Her work is now acclaimed and her fame is still a result of her unrelenting strengths. She is having a One-Of-A-Kind, I'm sure Never-Seen-Before GIVEAWAY here. 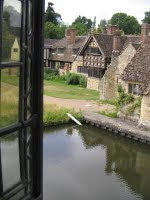 Here's a clue...She was in Anne Boleyn's Bedroom...And this is the view from Ann's window! You need to head on over there for more details! This Plaidy novel begins with Margaret Tudor as a young girl. She is portrayed as strong-minded and very defiant, yet close to Henry, her brother. I love the way from the very beginning the two of them go at it in terms of who will rule first. Margaret is so intent on getting married and when all of a sudden it’s decided that she is to be wed to the King James IV of Scotland, although she is somewhat reluctant, she’s also extremely delighted. Read the rest here. I’m pretty used to the whole thing by now, since she’s been doing this for a while. And I know right off the bat that if I fall for her very first question: Whatch’ya reading Mommy’- I’m done. But honestly, I love it that I can share my passion this way with my child. And, in my opinion, I think she has a pretty good grasp of many royals and some of their history. Needless to say, Josephine’s her favourite- that’s my girl! There will be an additional facet to my usual historical-fiction reviewing! I’ll be adding historical fiction reads for youngsters as well. Some of these I’ll be reading aloud to my daughter and some, I may still have to just summarize for her (language may still be too difficult). But here’s the novelty: Sophia will be adding her opinion (or my summary of her opinion) to my reviews. She’ll also be giving the books a 'castle'-rating. So, if any of you know of any children that might enjoy this particular genre, and you’re looking for something for them to read (or for them to be read to), please visit us on these special book review days for my young daughter’s personal opinion of the book. NOTE: Eventually, I may also add a section for other children to add their reviews to Sophia's. We'll take it one step at a time. Reading and reviewing is a passion and hobby that's fun- and we intend on keeping it that way! And for my Regulars, you know who you are..I want to THANK you from the bottom of my heart for always being there for me. Thanks for dropping by and entering the contest- or for just dropping by to visit-That was especially amazing. It should come to no surprise that I too am addicted to your blogs; you are just such wonderful people.